Nice lines "our parents our best-est well wishers? And don't they deserve the care that only us children can give them? " Some where i read "House named as Annai Illam but Annai Lives in Oldage home" that's true to some extent.. I like the old saying, 'Matha, Pitha, Guru, Deivam'. Its good to consider parents above gods. As a non-believer, I always encourage that. To the above comment, I want to stress that many parents only impose their narrow ambition on their children, be it joining an engineering college or taking up a job. That is why you see many children running away from their family, after growing up. You and I are the same age. And you have such a clear sense of your responsibilities! I am surprised and jealous at the same time. 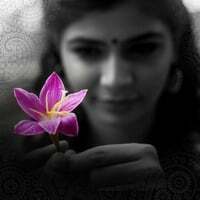 Respect Ms.Chinmayi Sripada. It is expected that a man of my age should never get sentimental about things instead be practical! Hard to go by expectations when life gets tricky, ain't it!? Thanks to you; your mesmeric voice calms it all. In my life time I wish to achieve atleast a fourth of what you have achieved in all these years. Please wish me luck. "There's absolutely no reason for an outsider to know your life" - This sounds real that outsiders(aka distant friends or any 'XYZ')who doesn't hold any authenticity in your life expects you to on the very few trail to share everything about you - sounds really insane to me. "I have also seen that when hanky-panky is not possible with someone a good group will go about labeling them as difficult :) Better be difficult, than easy. No?" "There's absolutely no reason for an outsider to know your life." In today's world, sharing most things, especially problems with outsiders became a fashion. Many complain this is wrong; that is wrong in their family. And they discuss with a friend or colleague.. who 70% doesn't give a solution. Most things will be normal (and difference will not exists) if people within the family discuss things honestly and transparently. I could not agree to your views entirely. Role Reversal Agreed. Financial Decisions not every parent is strong. Because some ideas are outdated. I am not talking about the values here. Just blindly following the elders decisions could not agree on this. They too are human beings and they are also bound to mistakes (Not knowingly, something which they thought as really good may turn out to be a disaster) and at times you may need an expert from the outside to help you out. With the advent of Technology, Open healthy Discussion will help and at times a help from professional will also help (loyalty is an issue, but can't help it sometimes we need to trust it will work out). I am not pointing fingers here. "running away from family"! That is running away from responsibilities, and is the choice of "weak at heart", who choose to play victim. And it is one example of parenting defeated by nature, which I believe would be "GOD's"(nature's) design. About the "Quote": trust your Parents, if their efforts fail trust your Teacher, if he or she fails trust the Nature; the trust will lead to love and respect and that eventually will give the strength to take care of those loved. @Manikandan Arumugam: well buddy life is just that adventurous! The human race breeds on competition, when just plain competion was not enough we sought a more challenging kind, "the cut throat" kind! When a person says that he or she is invincible no other person wants to believe in it until they have a cogent evidence. Nature's way! @Lakshmipathy: it is just as probable that the expert, outsider might be wrong! Most of us work with the TRUST that it will all work out. "Karmanyaeva adhikarastheye"
Agree with Lakshmipathy on the need for ensuring the Child's Future well being, and In that alone rests the future well being of the Entire Community. "And no one. Dare. Mess. With. My. Mom. " . This statement portrays aunty as a weak person, while your blog posts have captured otherwise. Can people on "moral/value system" high-ground, and also smart, be also vulnerable? General comment..
By the way, I don't remember such an interactive post from you asking "No? " multiple times...trying out a new blogging format ? With so many anonymous people I dont know how to name each one. No one dare mess with my mom means, if you say anything weird/impolite/rude/ anything on those line about my mother, I ll make mincemeat of you. Thats all. And you, of course, it means not YOU. But generally the random people. Yes I agree. Parents especially our Mothers have been by our side all the time and in the evening of their lives, as children, we need to stand up for them especially our mothers. Mothers go through a lot of tough times in the families in comparison to the fathers in general. What is your most favourite foreign (english/french) movie!? I am in the mood to watch a movie and it hit me that "for one time I should watch a movie that a celebrity likes best, and that trasitively would make me feel like a celebrity"! Goosy; I know..... but please help me. Thank you Miss! Ha ha lol lets see n war bat parents specially moms who never took care of their own children's???? Answer me that can they b out in a mudiyor illam. U r soooooo lucky to get a mom like her wat abt ppl who had the worst huh?